Literary genre-wise, this blog has something of a tendency towards thrillers and mysteries. However, I am also a big fantasy fan. In fact, my love of fantasy predated my fondness for spy and detective stuff. One classic series I never got around to reading until very recently was Stephen R. Donaldson's Chronicles of Thomas Covenant the Unbeliever. 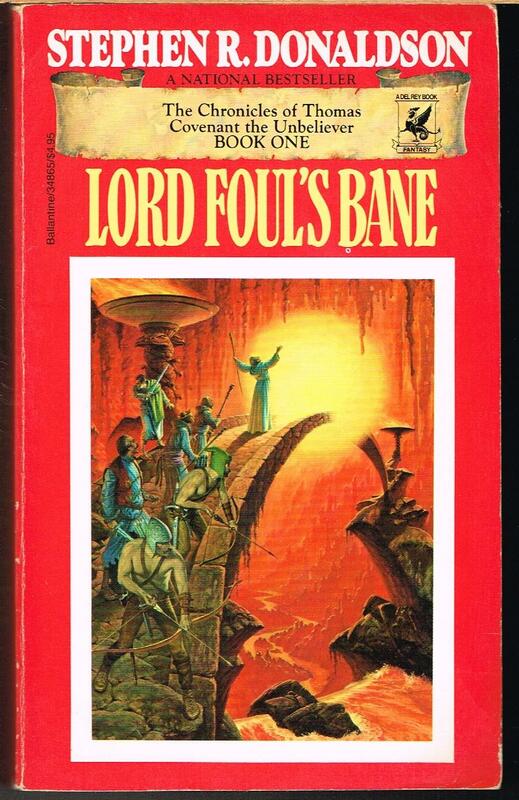 I tried to read the first one, Lord Foul's Bane, when I was in high school back in the '80s. I wasn't quite ready for it, and quit reading it after a certain infamous scene involving Covenant and and a girl named Lena. This January, I decided to give the book a second chance. I'm glad I did. I quickly devoured both it and the follow-up, The Illearth War. I am in the middle of reading the final book of the first trilogy, The Power That Preserves. Leaving aside the trilogy's important contribution to the genre, the Chronicles of Thomas Covenant isn't just outstanding fantasy fiction; it's outstanding fiction, period. I really appreciate the complex moral and ethical themes, and the fictional setting of the Land is simply an outstanding and well-developed setting. Due to Donaldson's power of description, I—unlike Covenant—almost believe it is real. In addition to being a novelist, Stephen R. Donaldson is also a martial artist, holding a Black Belt in Shotokan Karate. (As a side note, Donaldson didn't start training until he was in his early forties. He wrote a nice essay about "The Aging Student of the Martial Arts" that's worth a read.) I was surprised to learn that he was not a karateka at the time he wrote the first Covenant trilogy, as the books have something of a martial arts sensibility. For one, there are the Bloodguard. The Bloodguard are a group of elite bodyguards who do not age and do not sleep. They also eschew the use of weapons, preferring to use their hands and feet. I think there is much in the Oath for the serious martial artist to ponder. Even though I train a great deal in Kali—which is very much a killing art—I have no desire to actually kill anyone. (Well, not usually!) Heck, one reason I'm a vegetarian is because I don't want to kill animals (or eat dead ones) either. Violence should remain a last resort, especially lethal violence. I can't help but recall Bruce Lee's line from Enter the Dragon about "fighting without fighting." Hmmm... Bruce Lee as a Bloodguard. I could totally see it! Thanks! I've been looking for a new series. I'll check this out. While I loved the series (I finished the last book of the first trilogy last night), I feel I should throw out a couple of caveats for the uninitiated. For one, Donaldson's writing style can take a little getting used to. He can be awfully baroque in his language at times. Also, it isn't exactly an action-packed series. It's more about character and setting. Secondly, and perhaps more importantly, is Thomas Covenant himself. To put it bluntly, he's a jerk. and very unlikeable. As the series progresses he grows as a character, but he remains far from being your stereotypical fantasy protagonist. There's a good chance that if you start reading the first book—Lord Foul's Bane—you will want to quit by the time you're halfway done. But if you stick with it, it's quite rewarding.